The following materials are being offered for sale by Richard Ford, a bookseller in London for £3000.00 (ca. $4537.05). a. Two Typed Letters Signed from Sylvia Plath's mother, Aurelia, airmail, to "Professor Thomas", detailed, 7 & 28 May 1976, one with handwritten date the other with a handwritten PS. 7 May 1976: She is responding to the haunting contents of a long letter from Thomas, convinced that Sylvia would have left letters for her family which she quotes Thomas[?] as saying were "destroyed when found". She comments that many inaccuracies have been written about Sylvia's work. 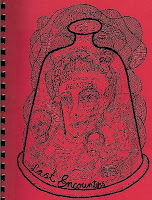 For example The Bell Jar wasn't autobiographical. She discusses the absence of a will and "her divorce [not having been] finalized", and Ted Hughes inheriting copyright. She is anxious for the children of the marriage - the living should count - her daughter can't be brought back. Ted Hughes has matured enough to look after them (formerly "foundering in immaturity"). She fears that the memoir he plans will stir up a controversy damaging to the children's faith in their father and to Hughes's later marriage to "a fine young woman of good family, who is both wise and loving in regard to the children". She understands the injustice he has suffered but would rather the children weren't hurt by a terrible "revelation". She asks him to send "the poems" [poems written by Thomas after Plath's death - see below). "I do believe that as a very sensitive person you were attuned . . . to something beyond our comprehension and that it was connected with my Sylvia. She adds details of the negotiations she and Sylvia were having about a return "home" in the spring. 28 May 1976: She has only just been able to read the poems he sent. "These are written with Sylvia's voice . . ." she briefly theorises about the lingering spirit. Her grief is still alive after 13 years, and says that the last letter in Letters Home was in fact her last letter, and that "the biotter, accusatory letters had to be omitted for the children's sake". A paragraph about poet, Robin Morgan. * The critics have lambasted her about ellipses in the book of letters but she explains Hughes's control. She is upset at the ideas of "wild parties" in her "dead daughter's apartment". She is understanding of Thomas's statement that he would publish the poems cutting out "references to Ted Hughes that might hurt the children". "Will you do me one more favour? Please destroy this letter after reading it." The PS mentions Sylvia's brother, Warren. *A photocopy of Robin Morgan's savage anti-Hughes poem is included in the same folder as the typescript of the memoir. i. Notes, 6pp., of notes by Thomas for his solicitor (one starts "Apologise to Judge - I didn't mean to cause offence") and for him to do ("Ask Usher to ask judge"). ii. Legal documents (case of Edward James Hughes and trevor Thomas) including Statement of Claim (2 copies); Statement of Defence, 2pp; Writ of Summons, c.12pp. ; Notice of Change, 1 Page; Notice of Motion, 3pp. ("the Defendant having failed to serve a Defence, Judgment ot be entered for the Plaintiff for such sum by way of damages for libel as may be assessed. iii. [Photocopy?] Letter from Ted Hughes's to Thomas's solicitors, 16 Feb. 1990, referring to the Statement of Claim and adding their view that Thomas has made defamatory statements in his memoir. Thomas has added a couple of annotations indicating resentment of the memory of an 80-year old being impugned and disagreement with the letter's thrust ("NOT SO"). iv. Copy letter from Thomas to Hughes lawyers, Nabarro Nathanson, saying he can't. In addition to the below, Ford also has for sale a copy of Trevor Thomas' memoir Sylvia Plath: Last Encounters (£250.00 / ca. $378.09). Trevor Thomas died in 1993; an obituary appeared in The Independent. Here is a little list of new/updated Sylvia Plath related things! 'Among the Narcissi'. Ashington, Eng. : Mid Northumberberland Arts Group, 1971. First separate edition. Lyonesse. London: Rainbow Press, 1971. Number 95 of 100. The Colossus. New York: Alfred A. Knopf, 1962. Author's presentation copy to Alfred Young Fisher. The Three Women: A Monologue for Three Voices. London: Oficyna Stanislawa Gliwy, 1968. Setting copy and proofs for second edition. Thanks to April Brewer for the list of specific Plath items. Connie Ann Kirk's Sylvia Plath (Prometheus Books). Frieda Hughes' Stonepicker and The Book of Mirrors: Poems (Harper Perennial). The above titles are being published as part of Faber 80th anniversary. The following was my introduction to yesterday's Sylvia Plath listening hour at the Woodberry Poetry Room. We had a nice group of people, as well as some lovely Plath archival materials which, I think, enhanced the event. The “voice” of the poet has a double-meaning. On the one hand it is speaker of the poem – the poems’ persona – which knows no boundaries: it can be a woman, a man, a shirt, a stone, a tree branch: anything. The other meaning is of course more literal: the spoken voice of the poet. And we are fortunate enough to work in or work with an archive of recorded poetry: the poet’s voice captured, here at the Woodberry Poetry Room. We are gathered here today to hear Sylvia Plath. Born and raised just miles from here, Plath’s first published poem appeared in the Boston Herald when she was 8. She lived in Jamaica Plain, Winthrop, and Wellesley before attending Smith College and University of Cambridge, in England. It was at this other Cambridge where, in 1956, she met Ted Hughes at the launch party of the Saint Botolph’s Review (attendees got to see an actual copy of the Saint Botolph’s Review). The first eight poems that we will listen to Plath wrote between 1957 and 1959. Most of these appeared in her first poetry collection, The Colossus, published in October 1960 by Heinemann in London. She recorded these poems for the Woodberry Poetry Room on June 13, 1958, and February 22, 1959. I’ve brought to show you, from the depths of Houghton Library, the reel tape containers that Plath wrote on, listing her poems and doodling. These are hard poems and I say hard intentionally. They are full of rocks, stones, s’s, t’s, and k’s. Even the titles betray their stoniness: “Childs Park Stones”, “Mussel Hunter at Rock Harbor”, “Green Rock, Winthrop Bay”, and “The Stones” to name a few. This reliance on rocks isn’t surprising for Sylvia Plath was a poet who looked to nature and to landscapes (physical and mental), and particularly to the end of land: the sea, for her inspiration. The stones she writes about entrap her and I believe these recordings illustrate that, poetically speaking, she was sealed inside a bell jar not made of glass, but of stone. But as it goes with poets, once a collection is published that’s it: it’s over. The poet must move on: and that is exactly what Plath did. One of Plath’s greatest supporters, A. Alvarez, said this about the poems in The Colossus, “It is this sense of threat, as though she were continually menaced by something she could see only out of the corners of her eyes, that gives her work its distinction.” (“The Poet and the Poetess.” The Observer. 18 December 1960: 12) Plath’s progression is evident in “Parliament Hill Fields”, “Candles”, and “Leaving Early”. Her voice is different, the poems more direct. In listening to these later poems, collected and published in 1965 as Ariel, poems such as “Daddy”, “Lady Lazarus”, “Nick and the Candlestick”, “Ariel”, Fever 103°”, “Cut”, etc. it is quite apparent that they have sprung from a completely different form of composition. They are easy and flowing, the language like “an engine” and “obscene”, to quote from “Daddy”. The voice of Sylvia Plath is powerful: both in regards to the speakers of the poems and her actual voice. Her voice booms now even though these recordings are forty-five to fifty years old; in these recordings, she is immortal. Listening to Plath read her own work helps us as readers; Plath’s voice acts as a guide to her poetry, assisting us in understanding how to read and interpret them. For example, Plath laughs while reading “Daddy”, a clue not to be overlooked. This is a reminder that Friday, 17 April, 2009, there will be an poetry listening event at the Woodberry Poetry Room in Lamont Library, Room 330, at Harvard. If you're in the area, come on by for a 3 PM start. I'll be introducing this week's Reel Time on Sylvia Plath, as well as playing a selection of Plath's poetry recorded for the Woodberry Poetry Room. On hand, also, will be some archival holdings that can only be seen in the Poetry Room! On Sunday, David Barstow of The New York Times published "A New Chapter of Grief in the Plath-Hughes Legacy" on the death of Nicholas Hughes. This is a very good article on the subject, certainly one of the finest published in the last three weeks. Thanks to Amanda for pointing this out. Recently I found a very lovely blog: Sylvia and Ted Collection. In Sylvia and Ted Collection, Laurie is highlighting rare, limited, first, signed, and other editions of Sylvia Plath, Ted Hughes, etc. in her personal collection. It is an extremely generous offering with very lovely images as well as bibliographic and other commentary. Collecting Sylvia Plath (or Ted Hughes or another author) can be a very rewarding experience. Although some of these books, broadsides, long playing records probably cannot be or have not been read, handled or even opened, there must be a huge amount of joy in just getting to look at them daily. I've worked with many of these book myself at rare book rooms and I've gazed admiringly at them at Book Fairs. What Laurie is doing is something unique and fantastic for those who find themselves to be inclined to Plath. Plath Profiles, Volume 2, is really coming together. Are you working on a paper or poem or book review for submission? According to the deadline I actually set, you have only until 15 April to submit! I'm not sure how hard a date that is really, but if you've got something we'd love to consider it. 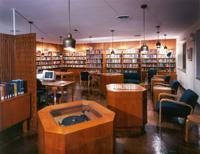 The Woodberry Poetry Room hosts listening hours of its archival poetry recordings most Friday's during the academic year. On Friday, 17 April, I'll be introducing a listening hour of Sylvia Plath's poetry, as well as selecting those poems that will be heard. The Woodberry Poetry Room is open to the public, so come on by. We start at 3 PM. I'll also be showing off some of the Woodberry's holdings: such as the proof's of The Colossus (Heinemann) and Ariel (Faber) and the original reel-to-reel tape containers from June 13, 1958 and February 22, 1959 with the poems handwritten in by Plath. 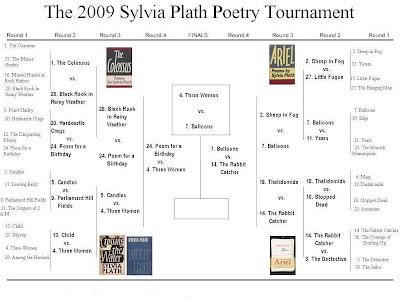 The winnter of the 2009 Sylvia Plath Poetry Tournament is "Three Women". "Balloons" gave its all, but could not rise above "Three Women". Thank you to all who read the poems, voted, and gave wonderful statements about their choices. The finals are set! The voters have spoken. In this corner, weighing in at three voices, with too many lines and too many stanzas to count right now and representing Crossing the Water/Winter Trees Region we have "Three Women". 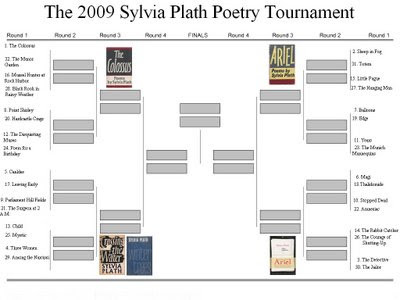 Plath triple-voiced monologue tour de force which beat out The Colossus' seven part extravaganza "Poem for a Birthday" in a fairly close race. And in this corner, weighing in at 30 lines in six, five-lined stanzas and representing Ariel we have "Balloons". Possibly the last poem Plath wrote, "Balloons" was able to dislocate, disengage, and discombobulate "The Rabbit Catcher" - completely. This is a wonderful, late poem by Plath composed just six days before her death. Though critics long called for the restoration of Plath's intended Ariel, you, the voters - all five of us, selected and elected a Hughes-inserted poem. How ever will a winner be chosen? Simple - by voting. The winner be announced on Tuesday morning, thus leaving voting open through Monday. Well, the final four are set. Thanks to those who voted by comment and by private email - I am so pleased that more people participated. The accompanying conversation to the posts is, I feel, a wonderful step in this blogs development. I hope it continues around other posts. Round 3 was decisive only in the Ariel Restored region, with "The Rabbit Catcher" amputating "Thalidomide". Each of the other races was decided by one vote each. So, we have "Poem for a Birthday" vs. "Three Women" and "Balloons" versus "The Rabbit Catcher". Wow. In the former region, we have two seminal poems whose composition spurned the two choices in the latter region. I already know where my votes will fall and will re-read past arguments/justifications again and hope to see some new analyses. Linda Gray Sexton, the daughter of poet Anne Sexton, contributes the Op-Ed "A Tortured Inheritance" in today's New York Times. The Op-Ed is on the recent death of Nicholas Hughes, son of Sylvia Plath and Ted Hughes which of course gripped worldwide attention the week of March 23. One word: Bloodbath. "Sheep in Fog" and "Balloons" obliterated their challengers. Poor "Years" was left, like "Words", 'dry and riderless'. "Years", I'm sorry, but everyone "can tell what [you] lack": votes. "Candles" torched "Parliament Hill Fields" (something Guy Fawkes didn't even get to see) but the other competitions were all ties. How interesting! Round 3 features some really interesting match-ups. "Black Rook and Rainy Weather" versus "Poem for a Birthday" and "Candles" versus "Three Women". I don't know how "Sheep in Fog" versus "Balloons" will turn out; and "Thalidomide" versus "The Rabbit Catcher" offers Plath at her best. Thanks to those that voted! Round 4 will be posted on Saturday with the finals appearing Sunday. Also on Sunday, I will start serializing a forthcoming novel about Sylvia Plath and so much more. Well, competition was as fierce the 2009 Sylvia Plath Poetry Tournament got under way - however with only three votes there were quite a few ties. I'll accept write-ins (Jim! ), but with only one vote, Fever 103 sadly didn't make the cut. In Round 2 we'll hopefully see more votes and opinions from the blog's readers? I ought to lay off the wine, quite a few typos in the bracket. 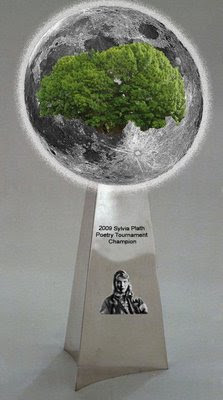 Vote for your favorite poem in the competition by emailing me or leaving comments... There are four regions in the 2009 Sylvia Plath Poetry Tournament: The Colossus Region, the Ariel Region, the Crossing the Water and Winter Trees Region, and the Restored Ariel Region. Poems were selected mostly at random; the selections in the two Ariel regions reflect those selected by Plath (Restored Ariel) and those selected by Ted Hughes (Ariel). This will be particularly fierce. So, start those office pools. Recaps and those advancing will appear through the end of the tournament. Results for Round 2 will be posted Tuesday.